Genealogists and historical researchers are detectives. They untangle complicated relationships, some of them hidden from the view of the societies of yesterday and today. Sometimes confusion occurs because of missing documents, unclear handwriting, mistakes in spelling names and places, and sometimes—rarely—it occurs because of outright deception. In this piece Julie Schopieray uses all of the tools of the trade of genealogical research to reveal how a local man, Glenn W. Curtis, deceived women all over the United States, convincing them to marry him, and eventually absconding with their wealth, jewelry, and, no doubt, their self-respect. It is a detective story in the tradition of Sherlock Holmes and Agatha Christie. As a research volunteer for the historical society, I respond to incoming emails which occasionally include requests for help with finding obituaries or other genealogical data on family members who lived in the Traverse City area. A request came from a woman who was hoping to discover what had happened to her grandfather, Glenn W. Curtis, and to confirm the true identity of her grandmother. She told me that for over 35 years she has tried to find out where Curtis ended up and that very little was found for the whereabouts of her grandfather. Not one to back down from a good research challenge, I took on the search for this mysterious man and his wife. Using the names and dates provided by my email correspondent, I started my search by familiarizing myself with the Curtis family. I followed their life using online biographies, census and marriage records on Ancestry.com and FamilySearch.org and learned that they settled in Traverse City in 1894. Because the family had already exhausted traditional genealogy resources, I started an online newspaper search. As it turned out, searching newspapers was the best tool I could have used for this quest. Because the scope of this story ended up being so widespread, finding any results would have been impossible without digitized newspapers from across the nation. I started by searching in the local paper, looking for any mention of Glenn Curtis. My first clue was a small notice which stated that he had gotten married: “The friends of Glen W Curtis will be surprised to learn that he is married, his wedding occurred last month in Florida.” [Grand Traverse Herald 3-28- 1907] To back this up, I checked the Florida marriage records on Ancestry.com. 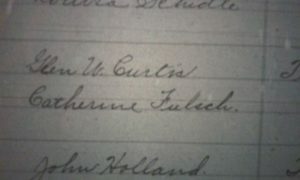 There I found Glenn W. Curtis of Traverse City marrying Emma Tillack on Feb. 8, 1907 in Volusia Co., Florida. That is all fine and dandy, except that the woman who asked for my help had a completely different name for her grandmother– Catherine Flusch. For forty years, she had assumed that was her grandmother’s name. That information came from her father’s birth certificate acquired from the county clerk in 1976. 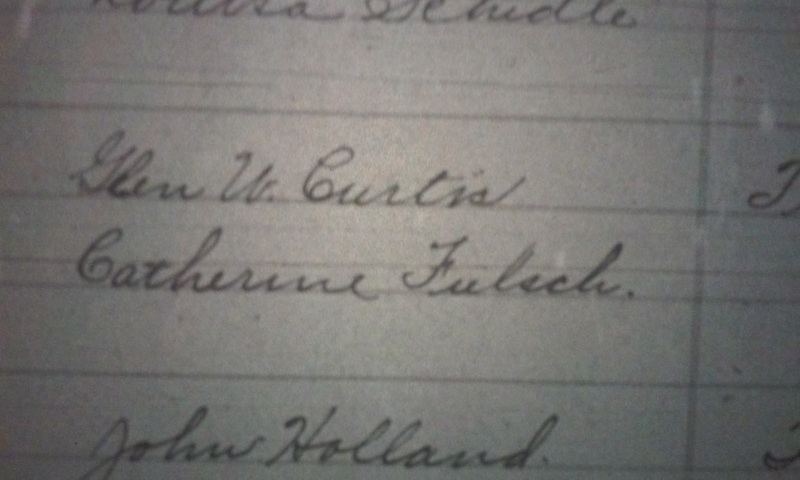 Because the name was nothing like the 1907 marriage information, I decided to try to find the original birth record, which was on microfilm at our local LDS Family History Center, and discovered that there was a spelling mistake on the last name. The 1976 clerk then misspelled the name from the 1908 record resulting in the name FLUSCH. Another strange twist in this name mystery which confused me even more, is an article I found from 1909 telling of a visit from the father of Mrs. Glenn W. Curtis. The article stated that he had come from Berlin, Germany along with her brother Earl and gave his name as August Ponsaning. That surname does not match ANY of the names associated with the first wife of Glenn W. Curtis. There will be more on this later. It wasn’t until around 1903, when in his early twenties, that there was any indication that Glenn was of questionable character. Small, curious snippets of information start around 1900 when Glenn was eighteen, mentioning him coming to visit his parents from various places– Grand Rapids and Louisville, Kentucky. At first, I assumed his travels were job-related. I was soon to learn it was a job, but not what I had expected. I expanded my newspaper search from only Traverse City, to all states to see what I could find. Starting in January 1903, articles from out of the state began to appear. The earliest one I found which explained his occupation was in the Grand Rapids Press, dated May 5, 1903. Palm Reading Artist in Jail. From a “Professor” of palmistry to a vagabond, and thence to a cell in the county jail– that is the sad fall of “Professor Robert T. Glenn, alias Glenn W. Curtis. Curtis was arrested, together with Fred Broughton, by Deputy Sheriff Gates at Pettis near Alpine Station yesterday afternoon. It was reported that they had been making a business of living off the people of the community. The “Professor’s” belongings give evidence that however much the palmistry business may have gone to the dogs of late, yet it was once well worth his trouble. The officials at the county jail hold a large number of hand prints made upon smoked paper, by the use of which he was enabled to read the hands of people far away. There were a number of hand prints which had come from Traverse City, which Curtis gives as his home, as well as from Lansing and some from distant cities. 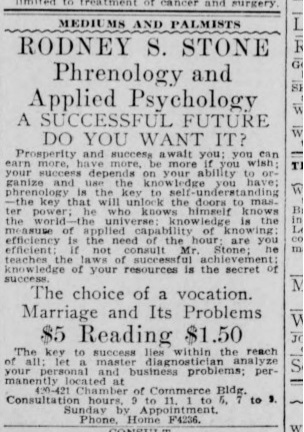 This major clue directed me back to the Traverse City papers which had several more small articles about Curtis and his surprising profession as a palm reader. Curtis came back to Traverse City after being released from the Grand Rapids jail and set up shop on Front Street. His ad in the Evening Record says “PROF. GLENN, PALMIST, 225 East Front Street. Come and learn what science says in regard to your life.” Less than year later he was in trouble again. He had taken his business to the nearby village of Kalkaska, where he was accused of not paying for his boarding house and scamming people who came to him for a palm reading. After a few more nation-wide newspaper searches, I was able to find an article in the April 8, 1907 Live Oak (Florida) Democrat which confirmed his marriage in Florida, and matches the description given by the father of the woman I am helping, of how his parents had met, which was this: “He said that his father courted his mother pretending not to be able to speak.” It also accounts for Curtis’s whereabouts between April and November 1907. 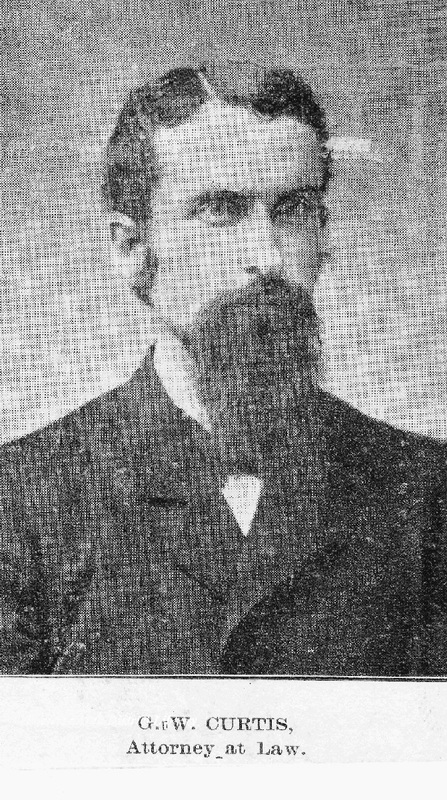 Madison, April 6.– Last Monday night a man registered at the Lines house as Prof. G. Willis Curtis, and with his wife was assigned a room. The next morning he was found to be a deaf and dumb palmist, who was desiring to pull aside the veil from the future for $1.00 per head. His business was not prosperous, principally for the reason that some traveling men at the hotel had heard him talking in Live Oak the day before. After supper, about a dozen travelling men in the hotel office sent for the palmist to come down, which he did at once. With his ready pencil and tablet he wrote out the fortunes, past and future, of several. The men knowing his deaf and dumb nature to be only assumed, were anxious to find out his reason for travelling in this manner. Then finally, by threats, got him to talk. He said in explanation of his assumed role, that he was under an oath to support himself for two years as a deaf and dumb man, and to report to Chicago August 17, 1907, with a wife whom he had won as a deaf and dumb man. His stories conflicted in several details, yet those present decided to leave him alone, provided he leave the state. He left for Valdosta on the 6:40 train the next morning, and nothing was thought of the man until the clerk of the hotel reported that a suit of new clothes and a pair of shoes belonging to a guest of the house had been taken from the room which the palmist and his wife had occupied. The woman explained the matter by saying she thought the clothes belonged to her husband, as he had referred to them as being some new clothes he had bought. The couple claim to have been married recently in DeLand, where the woman has been teaching German, she says. Curtis pleaded guilty at his trial this morning before Judge Martin. The court then fined him $150, or six months in jail. Curtis gave notice that he would file motion for a new trial and went back to jail. Six months later, the exact length of his sentence, “G. Willis Curtis” is back in Traverse City and advertising- “Consult G. Willis Curtis, Palmist, Phrenologist, Astrologer, 217 East Front, up stairs.” Going against the warnings of the men at the hotel, on Dec. 5, 1907, Curtis headed back to Florida “where he will spend some time traveling over the state, and will also travel in other states, carrying on his profession of palmistry” It is believed he left his wife behind in Traverse City. It was after his release from the Florida jail when she became pregnant with his son. It seems this was the last time Curtis was in Traverse City. According to a 1909 article, Emma resided in a boarding house a block from Glenn’s father and step-mother. With her husband out of town, his parents paid her board and helped her during her pregnancy. According to later recollections of Emma and Glenn’s son, George, Judge Curtis referred to Emma as “his little black kitten”. The birth of George A. Curtis was noted in the paper in late August 1908. Emma stayed in town at least until mid-1909 when the paper announced the visit of her father and a brother. It is this article in which the name given for her father is August Ponsaning. It is confusing because PONSANING does not match the surname on her marriage license or the name on the son’s birth certificate. The only possibility is that it was a mistake made by the reporter. Even after hours of searching, I came up with nothing even close to this name. Searching newspapers for more on Glenn and Emma Curtis, I found nothing for about the next four years. The only solid clue for this time period is a 1913 divorce record found on Ancestry.com in Wayne Co., Michigan, but because the last name of the woman is left off the document, it only complicated the mystery. It had to be “our Glenn” because the marriage date and location match the Florida record exactly. The divorce was granted– the reason was stated as desertion. It seems he just plain abandoned her and his son. The family believed Mrs. Curtis took her son to Hartford, CT, to stay with Emma’s aunt, Ida (Enders) Langdon, on and off between his birth and 1915. Mrs. Langdon was mentioned in a 1909 article which described the Traverse City visit of Emma’s father. Ida Langdon, came on that trip as well. The article states that Emma’s father had taken ill with typhoid fever when he arrived in the country and a sister-in-law took him to her home in Hartford for a month until he recovered. Mrs. Emma (Tillack) Curtis and her son George can not be conclusively located anywhere in the 1910 census. George himself stated in a 1971 Social Security document that he lived with his grandfather in Traverse City until he was 5 1/2 but he is not listed in the household of Judge George Curtis in 1910 or anywhere else that can be determined. An Emma Curtis is found working as a servant for a family in Arenac County, MI in 1910 and is about the same age, but her birth place is listed as Michigan, so it’s not positive she is the right person. A Louise Curtis is found in a 1912 Detroit directory working as a waiter, but again, there is no evidence it is her even though according to the 1913 obituary for her brother, Emma Curtis was living in Detroit. Around this time she started using the first name Louise or Louisa instead of Emma which added to the confusion. We know it was there where she filed for divorce and officially ended her relationship with Glenn W. Curtis. Nothing much is found of palm-reader Curtis between 1907-1914, but it is believed he was in New York City by 1914. Searching the 1910 census resulted in nothing. He is not found in any census record after 1900 because he rarely used his real name or stayed in any one place very long. As it is obvious he left Traverse City for good, likely at the urging of his own father, the next step was to continue the search in out of state newspapers. 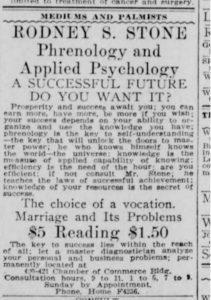 Several more articles were found by using keywords such as “palmist”, “clairvoyant”, “Glenn”, “Glen”, “Willis” and “Curtis” in various arrangements. What was found is fascinating. In 1914, Glenn’s father, George W. Curtis, died at the State Hospital in Traverse City, of “organic brain disease”, what is now called dementia, possibly caused by a stroke or other physical illness. He had continued to practice until about a year before his death. His obituary stated that his son Glenn was in New York City and his grandson in Hartford. What makes finding documentation for these statements difficult is that they fall in between census years. Children are not listed in city directories, so no other sources are available to confirm where young George and his mother were living during these years. It appears that Glenn Curtis was in New York City as stated in his father’s 1914 obituary. A marriage record was discovered which shows that on 30 Dec, 1915, Glenn married Mary Josephine Glynn. Her story is interesting too. She was the daughter of an Irish immigrant father who worked in the coal mines of east-central Pennsylvania. Her parents made the news in 1889 when Mary was just a toddler: they were accused of poisoning several family members in order to profit from life insurance policies. Several of their close relatives mysteriously died, each with similar symptoms as a result of arsenic poisoning, including Edward Glynn’s own parents. Each of these people had insurance policies to be paid to Edward. Six months after her first husband mysteriously died, Edward married Mary Halpin, his first cousin. Together they had several children, one being Mary Josephine. After their arrest, the couple spent several months in jail, but were acquitted due to lack of solid evidence. Mrs. Glynn died suddenly in 1890, which looked suspicious, but her death was from heart troubles, not poisoning. Edward Glynn was arrested again in 1904 for arson and sent to prison. Obviously, Mary J. Glynn had a difficult childhood. She likely left home as soon as she was old enough and headed to New York City to find work. How she met Glenn Curtis is unknown. Did he fool her with his deaf-mute palmist act too? Where she ended up isn’t certain, but it is probable she returned to Pittston, PA and lived with two of her brothers because by 1916, Glenn Curtis had abandoned her too. In 1916 Glenn Curtis left New York and headed to the west coast. As pieces fall together from newspaper searches, it seems he was on a mission to marry as many women as he could. Over the next three years, Curtis would marry at least three women—using false names—then take their money and disappear. Later that year, he was practicing “Phrenology and Applied Psychology” in Los Angeles as Rodney S. Stone. In 1918 I found him in Alameda, Oakland Co. California, where he registered for the World War One draft. The day of birth he lists on the registration matches perfectly, though is one year off from his Michigan birth record. He lists his occupation as “accountant” and his contact as Marion Curtis in Pittston, PA. His second wife Mary was from Pittston, and it’s possible that even though by this time he had moved on and left her behind as he did with his previous wife, he twisted her name a bit just to have someone to put on this registration form. His physical description was that he was of slender build, 5’10” tall, with blue eyes and blonde hair. Here in California, having perfected his time-tested ploy to win a wife—he struck again, this time winning one with money. His actual name comes up in this amusing article from the Sept. 27, 1919 Oakland Tribune. You can tell the reporter thoroughly enjoyed writing this article. SAN FRANCISCO, Sept. 27– Alleging that her husband had pretended that he was a deaf mute in order to marry her and gain from her a small fortune, Mrs. Leona Jackson, San Diego bookstore proprietor and business woman, is on her way to the southern city today in an endeavor to procure a warrant for her spouse, Fred Jackson, otherwise known as Glen Curtis, after consulting with Attorneys Albert Roche and Peter Ibos here as to the status on which she might obtain a divorce and $7000 which, she said, her mate possesses in bad faith. Mrs. Jackson told the local lawyers that she went to a local contracting firm, where she found her husband had once worked, and, after exhibiting his photograph, found that fellow employees and employers recognized him as Glen Curtis who had lost his position there because he talked too much. During four months of courtship in San Diego, she avers, Jackson or Curtis never uttered a word– exclaiming once in a while, “Ah-h-h!” but nothing more. 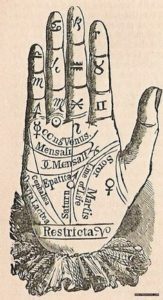 The novelty of having one’s fortune told by a deaf mute palmist appealed to San Diegans, according to Mrs. Jackson, and the man built up a brisk business, advising commercial men and housewives on certain problems close to their hearts. At last he prevailed upon the wealthy woman to marry him, she said, also getting from her consent to sell out the bookstore business and leave the southern city. That they were going on the stage together Jackson told her, is Mrs. Jackson’s statement, and they left for New York shortly afterward. Her suspicions were first aroused, it is alleged, when a man on the train came from the smoking car and told her that her husband had given the best talk on the League of Nations that he had ever heard. In New York they purchased an automobile, the woman told her attorneys, and started overland to San Francisco. Three weeks ago they arrived, following which Jackson silently bade goodbye to his wife and left for the south, pleading business. He never returned, the woman says, and now she is looking for her money and her husband or a long explanatory speech. Using the names in this 1919 article, I started searching available California newspapers online. Several more articles connected to this story added yet more questions and resulted in further searches with the various alias names Curtis was using. Keeping the newspaper keyword searches limited to the years 1919-1922, but open to all locations, I discovered that, after he left Mrs. “Jackson” in 1919, he fled to Texas where he met Miss Sammie Lane Tate, who, at the time, was in her mid-40s and from a prominent Waco family. A small newspaper article was found stating that the friends of Miss Tate would be surprised to know that she was quietly married in New Orleans on Dec. 6 to Rodney S. Stone of Washington D.C. None of her friends were aware of any relationship and definitely not one with Mr. “Stone”. Mrs. Tate-Stone returned to Waco within a month and is listed in the city directories as “widow of” Rodney Stone. No Rodney S. Stone can be found in any records for Texas or Washington D.C., or anywhere else for that matter. Also, no official marriage record can be found. After contacting a family member who had Miss Tate in her Ancestry.com family tree, I was told that the marriage by Miss Tate and the mysterious Mr. Stone was rarely discussed. She came back to Waco and told everyone that he had died. It must have been an embarrassing situation for a Baylor-educated woman to fall for a suave con man. When Mrs. Cleora/Cora (Lane) Jackson’s fraudulent marriage and desire for divorce made the California newspapers in 1921, another woman came forward with a similar tale. Mrs. Ida Trost, a widow from Galveston, Texas had met the deaf-mute Frederick George Carrington through a friend. “Carrington…through correspondence, told [Mrs Trost] of a proposed vaudeville act he was considering, stated that he was a war correspondent for the Associated Press, and eventually proposed marriage…They were married in El Paso and his “wish” he told her, was that he would regain his hearing and speech. 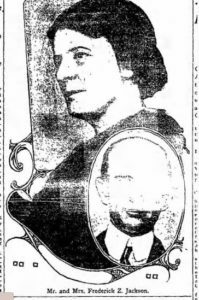 He was able to speak English, Spanish and German on the day of their marriage.” [Riverside Independent Enterprise,1921] They were married on February 26,1921 just a few months after his marriage to Miss Tate. They took a short honeymoon, then moved to Riverside, California where after a short time he took $1200, diamonds, a gold watch, and then vanished. 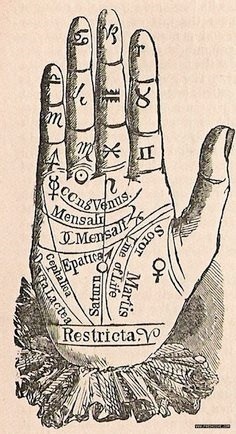 What is interesting is that so many seemingly well-educated and intelligent women fell for the deaf-mute palmist routine. At least, four or more women succumbed to Curtis’s charms using this method. Whether he fathered more children is also unknown. It is also interesting that he used the name Carrington. He was well aware of a man named Hereward Carrington who, during this time, was a well-known investigator of psychics, mediums and spiritualism, writing over 100 books on the subject and was known for exposing fraudulent mediums. Perhaps Curtis had read some of his books and picked up tips for his own business. One more piece of solid evidence was discovered once I learned the previous surname of Cleona Jackson and located the 1919 marriage record. On the marriage license, “Jackson” lists his father’s real first and middle names, his mother’s real name (Etta Smith) and listing his place of birth as Michigan. This to me, is the clincher– Frederick Z. Jackson was Glenn W. Curtis. An article in the Los Angeles Times included a photograph of Mr. & Mrs Frederick Z. Jackson but unfortunately, the microfilmed image of the man is terribly blurry. It is our only clue as to what he looked like. Even though he was sought for several years, there is no evidence that Curtis/Stone/Jackson/Carrington was ever found and charged for these particular crimes. It is believed he headed back east and to New York after this flurry of activity. It wouldn’t be the last time Curtis would use a fake name and woo a wealthy wife. The next known incident is all the way across the country in New York state five years later. The “modus operandi” once again fits. A 1926 Rochester, New York newspaper article tells of Glenn W. Curtis being arrested– charges brought by his wife Edith F. Sturdevant, a well-to-do widow. This time he had been posing as a Congregational minister using the name James Alexander Waterhouse and somehow charmed her into marrying him. He used mostly made up family names on the marriage license, lied about his age (added ten years– because she was ten years older), but did give a birth place of Owosso, Michigan (where his father’s relatives were from) and again used his father’s real first name, George. Searches of census, vital statistic and city directories prove that no James Waterhouse of Owosso existed, or the people with the other names he listed on the marriage license. Two months after they married, Mr. “Waterhouse” took $600 in cash, jewelry worth over $500 and on May 15, disappeared. He was “traced to New York, Philadelphia, Boston and back to Utica” and arrested. Charged with second degree grand larceny, he was held without bail. I next contacted the Monroe Co., NY county clerk’s office to request a search for court records but there was nothing found under Waterhouse or Curtis for the years 1927-27. It is very likely that he spend a few months to a few years in jail. It is here that the trail dropped off. Nothing further came up after 1926 using the same keywords in searches. Having exhausted all the online records I could find, I decided to contact a researcher in Rochester to see if she could help. She first searched the New York state death records and quickly discovered one for a Glenn Curtis who died in 1936. She sent for a copy which ended up being our man. It revealed the sad end to Glenn Curtis’s life. His death occurred at a state institution in Marcy, NY. He had contracted syphilis, which left untreated, causes a condition called general paresis—an inflammation of the brain in the later stages of syphilis, causing progressive dementia and paralysis. He had suffered from the disease for over two years. The death record also revealed that he had again married (#7 that we know of) to a woman named Evelyn. Nothing has been found about her or when/where they married. Curtis was buried in Syracuse, NY though it is thought he may have resided in Buffalo, NY before he was institutionalized. The record listed his occupation as “palmist” so he continued this practice right up to his death. It is a sad ending to this story, but the family now knows what happened to their grandfather. Even though he was quite a cad and conman, at least there is the satisfaction of knowing what became of him after their long search. It is doubtful that there is a grave marker for Glenn Curtis, but more research will be done to locate the exact cemetery and perhaps his grave. As a researcher, my goal was to answer the questions of the family as best as I could. One of the biggest desires for them was confirming the real name of Glenn Curtis’s first wife– their grandmother. After receiving a typed copy of his birth certificate in 1976, with the name Catherine Flusch as mother, they thought perhaps Glenn Curtis had fathered a child with another woman. However, no such person could be found. When I discovered the 1907 Florida marriage record, even before knowing the real story of Glenn Curtis, I realized that “Emma Tillack” would have had no reason to lie about her name, but after she became pregnant and was ultimately abandoned by this con man, a theory considered was that perhaps she temporarily used a false name to alienate herself from the cad Glenn Curtis. But after seeing the actual birth record with the clerk’s misinterpretation of the mother’s name, and again, a misspelling on the 1976 certificate, in my opinion, the name FLUSCH could be eliminated from this story. Where “Catherine” came from is still uncertain. Emma/Louisa Tillack-Curtis married twice more, the first, in 1915, to George Fisher in Philadelphia, where she and son George are found in the 1920 census, and then again around 1925 to John H. Guise of Harrisburg, PA. The clues to her real name are also evident on her 1936 death certificate. Her father is listed as August Tillack. August– as stated in the 1909 article of him visiting, and Tillack as her last name on her first marriage license. In an effort to confirm the Tillack name, a search using various spellings was conducted in immigration records and the jackpot document was located. A passenger list for the ship Lessing, arriving in New York City in Sept. 1902 shows 11-year-old Emma TILLAK traveling with an aunt, Wilhelmina Gley. On the record it states that Emma would be in care of her aunt Ida Langdon of Hartford, Connecticut. Ida’s exact relationship to Mrs. Curtis remained unclear until the discovery of an obituary and death record for a Max Tillack of Connecticut, who turned out to be Emma’s older brother. The obituary and death record for Max also solidifies the Tillack name. His death certificate lists his father as August Tillack and mother Augusta Enders, making their mother a sister to Ida Enders-Langdon of Hartford, Ct. The Social Security document discovered late in this research process also confirmed the name Louisa Tillack. With all of these facts–the ship record, marriage, obituaries and death records, the family is now convinced that Glenn Curtis and Emma (Louise) Tillack were their grandparents. The most important question that went unresolved for my patron family was what became of Glenn W. Curtis after 1905, the last Traverse City city directory he is listed in. What is found in the newspaper accounts is better than fiction. I ask myself—how likely it is that all of the characters in the ads and articles are about our Traverse City man? I say you’d have to go with the odds: Even though there were hundreds of people working as palmists and clairvoyants during this time–in fact, every town seemed to have at least one and sometimes several–how many men in the country practiced palm reading and had/used the last name Glenn and Curtis? Not many. Early on, he used some version of his real name though later he changed to completely different names. However, the name Glen Curtis was associated with the California episodes in several articles along with alias names which connects him to the articles using those names, and the fact that he repeatedly used the same method to fool people. This ties them all together and to the identity Glenn W. Curtis. He traveled the country conning people–especially vulnerable, older, single or widowed women–his entire adult life. Constantly on the run—changing his identity over and over—he disappears but only until another article appears describing once again, a con man with the same M. O., the deception and fraud perpetrated by a deaf-mute palmist in yet another town. How likely is it that others repeatedly used this same kind of trickery? Not likely at all. Palm Reading Artist in Jail. From a “Professor” of palmistry to a vagabond, and thence to a cell in the county jail– that is the sad fall of “Professor Robert T Glenn, alias Glenn W. Curtis. Curtis was arrested, together with Fred Broughton, by Deputy Sheriffs Gates at Pettis near Alpine Station yesterday afternoon. It was reported that they had been making a business of living off the people of the community. The “Professor’s” belongings give evidence that however much the palmistry business may have gone to the dogs of late, yet it was once well worth his trouble. The officials at the county jail hold a large number of hand prints made upon smoked paper, by the use of which he was enabled to read the hands of people far away. There were a number of hand prints which had come from Traverse City, which Curtis gives as his home, as well as from Lansing and some from distant cities. After a few more nation-wide newspaper searches, I was able to find an article in the April 8, 1907 Live Oak (Florida) Democrat which confirmed his marriage in Florida, and matches the description given by the father of the woman I am helping, of how his parents had met, which was this: “He said that his father courted his mother pretending not to be able to speak”. It also accounts for Curtis’s whereabouts between April and November, 1907. The family believed Mrs. Curtis took her son to Hartford, CT, to stay with Emma’s aunt, Ida (Enders) Langdon, on and off between his birth and 1915. Mrs. Langdon was mentioned in a 1909 article which described the Traverse City visit of Emma’s father. Ida Landon, came on that trip as well. The article states that Emma’s father had taken ill with typhoid fever when he arrived in the country and a sister-in-law took him to her home in Hartford for a month until he recovered. Mrs.Glynn died suddenly in 1890, which looked suspicious, but her death was from heart troubles, not poisoning. Edward Glynn was arrested again in 1904 for arson and sent to prison. In 1918 I found him in Alameda, Oakland Co. California, where he registered for the World War One draft. The day of birth he lists on the registration matches perfectly, though is one year off from his Michigan birth record. He lists his occupation as “accountant” and his contact as Marion Curtis in Pittston, PA. His second wife Mary was from Pittston, and it’s possible that even though by this time he had moved on and left her behind as he did with his previous wife, he twisted her name a bit just to have someone to put on this registration form. His physical description was that he was of slender build, 5’10” tall, with blue eyes and blonde hair. Here in California, having perfected his time-tested ploy to win a wife—he struck again, this time one winning one with money. His actual name comes up in this amusing article from the Sept. 27, 1919 Oakland Tribune. You can tell the reporter thoroughly enjoyed writing this article. The lack of evidence for certain periods is a combination of gaps in digitized newspapers, unknown aliases and possibly time spent in jail. His descendants ask what ultimately happened to him? Where and when did he die? The family had heard various rumors for his demise– one of him falling from a train and the other that he died of a stroke or heart attack in his 40s. With the help of another researcher and her discovery of his death record, after 40 years the family has their answer. With every new article discovered, the tale of this incredible con-man kept me wanting to find every possible twist and turn. It is this kind of “truth is stranger than fiction” story that I love to research. of him falling from a train and the other that he died of a stroke or heart attack in his 40s. With the help of another researcher and her discovery of his death record, after 40 years the family has their answer.